Dancing with Poseidon in a costume by Criaturas, at their Ecstatic Container Spectacle. Many people remember the legendary snake dancing scene in From Dusk Till Dawn, where Salma Hayek amazed everyone by gracefully moving around with her reptile partner. Want to bring some of that grace, danger and spectacle to your event? I can perform dancing acts or walk around in costume with the snakes to bring that exotic or scary vibe to your party. I can also do photoshoots or let your visitors take a picture with the snakes. These beautiful creatures are sure to get attention wherever they go... and maybe scare a few people in the process. Voodoo Priestess burlesque act with boa constrictor! 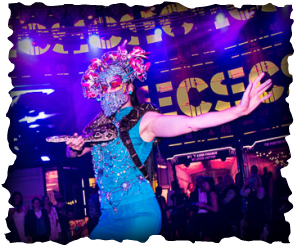 This spectacular burlesque act features both snake dancing and fire eating, making it a surprising and captivating act for all audiences. I also perform full snake dance acts in mysterious outfits where I take the snake out of its cage on stage! When working with live animals, their well-being is the number one priority on my list. Therefore, I will need to make certain arrangements to ensure their comfort and safety. Should you be interested in a snake act, I will explain the requirements to you in full detail. During hibernation, the snake acts are temporarily unavailable. Depending on the outside temperature, acts in open air might also be unavailable due to the snake's need for warmer temperatures. When booking, you can choose which snake you would prefer, but I do hold the right to change that decision based on their shedding cycle, health condition and overall temper that day. At Hollywood Boulevard burlesque show, a 50 shades of Grey themed snake act.